The Redskins site has reported that a multi-year project has begun to install "Party Decks" in the end zones of FedEx Field. The decks will be complete in time for the 2012 season. Roughly 4,000 seats are being removed as the construction begins which begs the question: What about season-ticket holders in those seats? 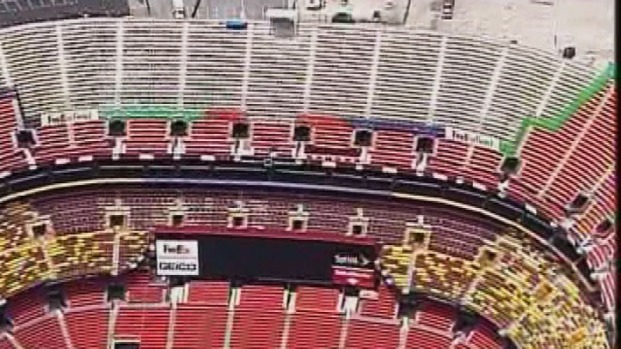 Workers at the Redskin's Fedex Field removed seats on Monday in preparation for new party decks to be installed behind the end zones. Some say that the party decks are a business strategy. Rich Tandler of RealRedskins.com thinks the move boosts the value of Redskins tickets by reducing the capacity of the stadium. Others think its a case of keeping up with Jerry Jones - the Cowboys new field features party zones, as do most modern football stadiums. When construction is complete on both of the decks, the capacity will be reduced to around 85,000 - down from 91,000. We can't wait to see what the decks look like and have to offer when they are complete. Now all we have to do is hope the Skins give us something to party about in 2012!